The World Leader in Cargo Protection! Protect the corners of your cargo from strap damage! 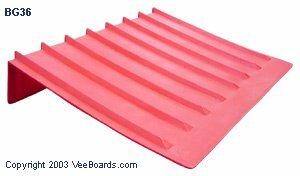 VeeBoards® are manufactured from ultra strong, crack resistant, high-density polyethylene and have been tried and tested all over the world. They are light weight, user friendly and long lasting, making them ideal for the rough and tough trucking industry. While being strong enough to hold a load of drums in place, they are also flexible enough to bend when the cargo is not of a uniform shape. DOT requirements specify that all loads should be secured in such a way as to assure that no pieces come loose, endangering those behind. Also, VeeBoards MUST be used if the strap is in any danger of being cut or damaged by the freight. Spread the pressure of the strap over 12", 24", 36" or 48"
G.W. Burnett of Buffalo, carriers of cement and building products increase their number of VeeBoards® to 130. "Working exceptionally well" reports Eric Bauer. Sales of 12" VeeBoards® to dry wall haulers proves to be the best product on the market. Building supplies carriers become major users of VeeBoards®, protecting shingles, roofing material and drywall, much to the delight of the consumers. Back to the VeeBoards	® Catalog!